The close connection between philosophy of language and philosophy of law has been recognized for decades through the work of many influential legal philosophers. This volume brings recent advances in philosophy of language to bear on contemporary debates about the nature of law and legal interpretation. The book builds on recent work in pragmatics and speech-act theory to explain how, and to what extent, legal content is determined by linguistic considerations. At the same time, the analysis shows that some of the unique features of communication in the legal domain - in particular, its strategic nature - can be employed to put pressure on certain assumptions in philosophy of language. This enables a more nuanced picture of how semantic and pragmatic determinants of communication work in complex and large-scale systems such as law. Chapters build on explanations of key elements of statutory language, such as the distinction between what is said and what is implicated, the possibility of ascribing truth-values to legal prescriptions and the structure of legal inferences, the various forms of vagueness in the law, the distinctions between vagueness, ambiguity, and polysemy in legal language, and the distinction between concept and conceptions, mostly in the context of constitutional interpretation. 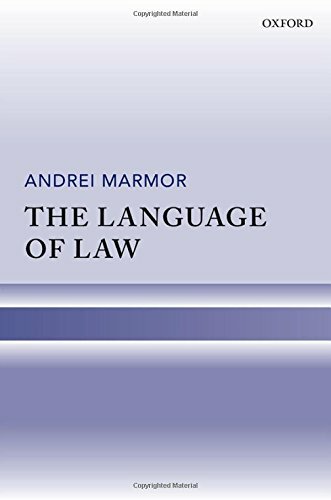 The book demonstrates that paying close attention to the kind of speech acts legal directives are, and how they determine the content of the law, enables a better understanding of the boundaries between normative and linguistic determinants of legal content.